Marek A. Hansdorfer, M.D.1, Jane M. Tsui, M.D.1, Marco C. Visaggio, M.D.1, Gem G. Runyan, M.S.1, Mark A. Randolph, M.A.S.1, William S. David, M.D., Ph.D.2, Jonathan M. Winograd, M.D.1, Robert W. Redmond, Ph.D.3. 1Division of Plastic and Reconstructive Surgery, Massachusetts General Hospital, Harvard Medical School, Boston,, MA, USA, 2Department of Neurology, Massachusetts General Hospital, Harvard Medical School, Boston,, MA, USA, 3Wellman Center for Photomedicine, Massachusetts General Hospital, Harvard Medical School, Boston,, MA, USA. BACKGROUND: Segmental peripheral nerve deficits are challenging injuries associated with poor outcomes. Gold-standard large-gap (>3cm) reconstruction requires nerve autograft. Alternatives are sought in clinical scenarios where donor limb is not available (e.g. multiple extremity trauma) or donor site morbidity (e.g. painful neuroma formation, loss of function) makes autograft use suboptimal. A variety of alternatives have been studied: allografts, conduits etc. Most of these studies have been performed in a rodent sciatic nerve model, which allows for histological evaluation and some functional assessment but may not be clinically relevant to the study of large nerve gaps. We report a non-human primate (NHP) model which recapitulates human anatomy, allows for objective quantitative functional outcomes testing, electrophysiology and histomorphometry, with minimal morbidity to subjects. The objective nature of this array of end-points provides a detailed evaluation of nerve regeneration. METHODS: Twelve rhesus macaques underwent 4cm proximal radial nerve defect creation in the right upper extremity, the radial nerve transected proximally at the humeral spiral groove, distally prior to the branch to brachioradialis. The radial nerve was selected as it is responsible for a unique function with no input from other nerves which may confound recovery data in other models. Three repair techniques were evaluated for proof of principle: autograft/suture, acellular nerve allograft (ANA)/suture, ANA photosealed in place with light-activated human amnion wraps. 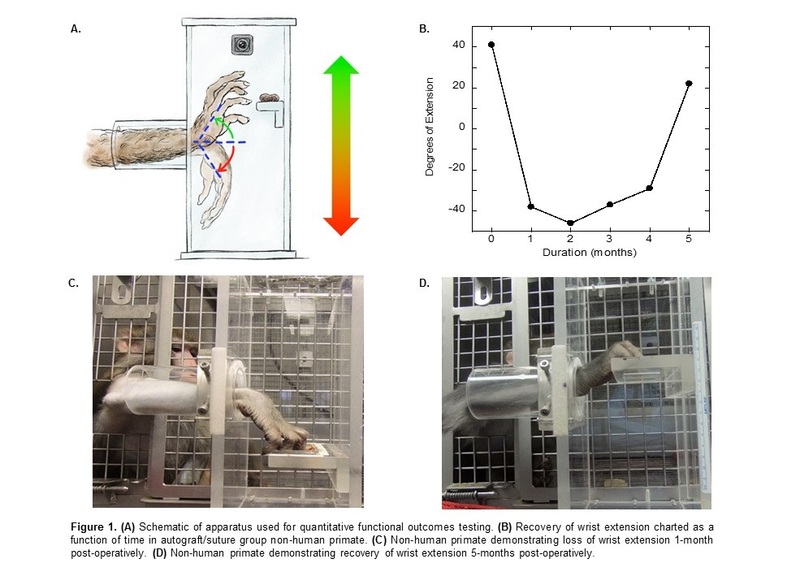 An objective functional outcome test was conceived using an apparatus that accurately measures the degree of wrist extension as a function of time after defect repair [Figure 1A,B]. Electromyography (EMG) is performed at 0, 120, 240, and 365 days (euthanasia). Histomorphometry, muscle mass retention, and optical coherence tomography (evaluating remyelination) are performed at euthanasia. RESULTS: No morbidity or mortality was seen. Average loss of wrist extension was 87.0° after radial nerve defect creation [Figure 1B,C]. Autograft group animals recovered 67° of extension at 5 months demonstrating that recovery is nearly complete in the control group at 5 months in this model [Figure 1B,D]. Wrist extension recovery was slower, as expected, in the ANA groups. CONCLUSIONS: This radial nerve defect model improves upon existing animal models by allowing for large nerve gap testing in a primate model more analogous to the clinical problem in humans. It provides multiple end-points for analysis including objective functional outcome assessment, histomorphometry, and EMG, and can be used as a versatile tool for analysis of the full spectrum of nerve reconstruction techniques and translation to human trials.